Explore! examines the accomplishments of twenty adventurers from history. Most names you’ll recognise, but perhaps you won’t know the details of all their stories. Here readers get a glimpse of the dangers involved with being the first to try something, or go somewhere new. It begins with a timeline of exploration, starting with Marco Polo travelling to China in the 1200s, and going right up to 2012, when James Cameron travelled solo in a submersible to the deepest part of the ocean, and Felix Baumgartner skydived faster than the speed of sound from the edge of space. Explore! takes an inviting approach to history and exploration, with an easy to navigate layout, and many carefully selected photos, diagrams and objects. The journeys included are categorised into polar, ocean, land, desert, sky and new frontiers, and cover people like Ferdinand Magellan (a round-the-world challenge), Edmund Hillary and Tenzing Norgay (the highest mountain), Amelia Earhart (pioneer of the skies), and Yuri Gagarin (first into space). Each story outlines the challenge and dangers faced, and puts it in historical context. There are only a couple of pages for each journey, but plenty of fascinating information about what the adventurers did, where and when. You’ll also find tips on how to avoid frostbite in Antarctica, treat scurvy, climb the rigging to the crow’s nest aboard ship, use your watch as a compass, build a jungle shelter, and lots more. 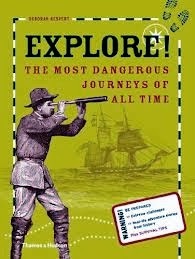 This is a great time capsule about some of the world’s pioneering adventurers, perfect for school projects or captivating would-be future explorers.